Launching this Summer, The Botanist introduces a new collection of cocktails, inspired by phyology, the science of plants, to the award-winning drinks menu. Each of the new additions stimulates the senses with the perfect combination of flavours. Cocktail lovers will be captivated by the ‘botanical theatre’ with every sip. Guests are invited to The Botanist to stimulate their senses with homemade botanical essences and scents. Atomisers with floral aromas add an immersive experience to the Passionfruit And Basil Crush; Lemon And Jasmine Collins, Blueberry And Passionfruit Martini, Poppy and Pomegranate and the Elderflower and Lavender Fizz Cocktails. The new botanical cocktails Raspberry Disaronno Sour, Apricot And Peach Smash, Pear And Tea-Wi Cup, Pimms Tea Cup, Peach And Apple Pot are delivered to tables in plant pots filled with dry ice. Fond of twisting up the classic cocktail too, The Botanist introduces a Rhubarb Gin Old Fashioned to their award-winning cocktail menu, with the rhubarb and gin bringing a botanical element to the old favourite. The Botanist has discovered using seasonal such as berries, plums, pears, lemon thyme, red amaranthe, thai basil results in maximising the flavour and the experience for all the senses. The beautiful floral surroundings of The Botanist has also inspired a selection of cocktails, including the herbal remedial Blackberry Mint Julep, served with a mint sprig and a blackberry garnish in a medicine bottle. 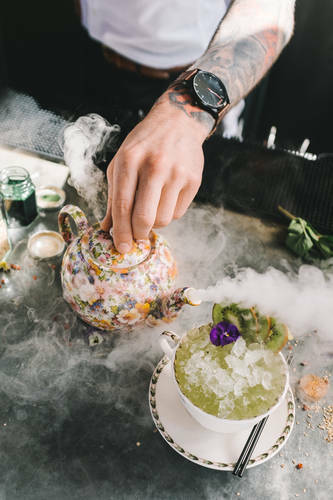 Nick Whitby, Head of Bars at The Botanist, explains how the new menu is a perfect combination of science and botany. The new cocktail additions will sit alongside the extensive botanical cocktail menu including firm favourites such as The Botanist and The English Mojito. The New World Trading Company is the proud operator of The Botanist across the UK including Alderley Edge, Birmingham, Chester, Leeds, Manchester, Didsbury, Newcastle, Marlow, Farnham, Knutsford, Sheffield and York.